Director Jean Cocteau once observed of Carl Dreyer’s great silent film La Passion de Jeanne d’Arc that it plays like “a historical document from an era in which cinema didn’t exist”. Certain films (including some I’ve blogged about before: The Seventh Seal, Aguirre, Eraserhead) give that impression – they are so self-contained that they seem to come to us as special messages from another world. It’s difficult to define the nature of this effect. It isn’t that these movies are “realistic” in a documentary-like sense – quite the contrary, many of them put cinematic tricks to great use. But they carry a conviction that makes it hard to think of them as existing outside the world they describe; when the lights go on it feels unreal to actually find a reel of film (or a DVD) with the movie’s title on it. 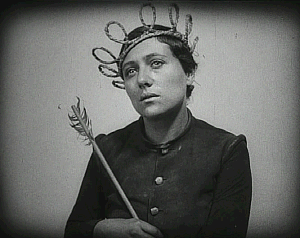 The most widely discussed aspect of La Passion de Jeanne d’Arc (and, with full respect to Dreyer and his great vision, the aspect most worth discussing) is the face and the performance of Maria Falconetti in the title role. Falconetti’s Joan is wide-eyed, tired beyond description, tears often running down her sunken cheeks. The haunted expression on her face could represent the unwavering conviction of a girl who has experienced divinity firsthand - but it could just as easily be the face of someone who has been driven to madness and is no longer sure of anything. This isn’t, after all, a film about the rabble-rousing heroine who led French troops to war on the strength of her visions, God firmly by her side every step of the way. It’s the story of a frightened, exhausted, lonely, even confused young girl being repeatedly questioned and cross-questioned by a group of tyrannical inquisitioners. My DVD of The Passion of Joan of Arc has two audio options – one silent, the other featuring the haunting “Voices of Light” choral soundtrack created especially for the film in the 1990s. Initially I tried to watch the film with the sound off, but the images were so stark and powerful that I needed an element of artifice, of manufactured drama. So I switched the soundtrack on after a few minutes – feeling slightly guilty until I remembered that when the film was originally screened in 1928 there would have been an accompanying score in the movie-hall anyway. I suggest anyone who gets hold of the DVD watches it with “Voices of Light” switched on. At least the first time. Trivia buffs may be interested to know that Antonin Artaud, of "Theatre of Cruelty" fame appears as one of the inquisitors. Dreyer is a significant influence on Lars von Trier, an influence that goes far beyond the fact of their common Danish Catholic background. They are both drawn to intense explorations of faith and suffering (typically of a woman who is pure of heart ), though of course von Trier's films are much more heavily ironized, in acknowledgment of the times. Perhaps Bjork is the modern Falconetti? You really are outstanding in your film reviews. In your other posts, I imagine an undercurrent of impatience, as if you wanted to finish it quick and get back to another film. You should also catch Dreyer's "Days of Wrath" and "Ordet", both available from criterion (the palika guy might have it). "Days of Wrath" is similar to Joan of Arc in some ways - a deeply repressive and tyrannical setting, a woman as the protagonist, a medieval age etc (though there are also differences). Ordet has one of the most amazing endings in the history of cinema - its probably completely unique. A must see. Incidentally, Dreyer was from a Danish Lutheran background, not catholic. But its also true,that Dreyer was not himself very religious (see Jonathan Rosenbaum's criterion collection essay here : http://www.criterionco.com/asp/release.asp?id=125&eid=135&section=essay). In this he seems similar to Robert Bresson: both made films which are intensely about religion (Bresson's Diary of a country priest) but even Bresson was an agnostic and not especially religious. Anonymous: Have seen Ordet but haven't ben able to get my hands on Day of Wrath yet. 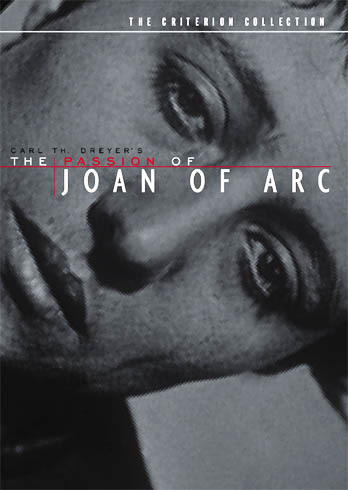 Interesting to hear that Dreyer wasn't very religious - sort of adds to my idea that Passion... doesn't necessarily think of Joan as a saint but simply as a young woman of great conviction. Cheshire Cat: now there's a nice, bizarre thought! In the context of "intense explorations of faith and suffering", there's also of course the Emily Watson character in Breaking the Waves. JAP: thanks. Actually, I often start to get impatient when a post starts going beyond 800-900 words. Want to wrap it up quickly then. Anonymous, thanks for the correction. Makes sense, given that Joan is the sympathetic character. But really, as you say, religion may not be a very useful lens through which to read Dreyer. I remember "Vampyr" (which is the only other movie of his I've seen) as eccentric and brilliant, but not religious in any conventional sense. I do disagree about Bresson. With "Mouchette" and especially with "Au Hasard Balthasar", the Jansenist belief in predestination is too powerfully relevant. great post and very learned comments too...! it is very interesting indeed to compare von trier with dreyer and see how the ideas of faith and suffering get a postmodern twist, specially in breaking the waves. 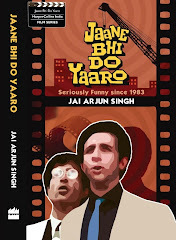 I sometimes long for those innocent pre-ironical age when someone could make films like these and still mean everything that they wanted to say. btw, who is bjork's husband? this is a bit OT but here's an interesting interview with Donald Ritchie about Japanese cinema. A large part of it is about Ozu (which is why i was reminded of Schraders book). Incidentally the site midnight eye is entirely devoted to japanese movies. well worth a look if you havent already done so. Thanks for this nice review of one of cinema's masterpieces; I saw the film recently and was struck of course by Falconetti's amazing intensity - but also by the faces of all the other characters around her, which seemed to me to come out directly of Leonardo da Vinci's caricatures, or some other medieval artist: certainly Dreyer has plunged his film into this brutally ambivalent world of good and evil that his B&W cinematography underlines so well.